Indians swapped their love for Hockey with Cricket. The catalyst was 1983 World Cup. The face behind this great team effort was Kapil Dev Ramlal Nikhanj. 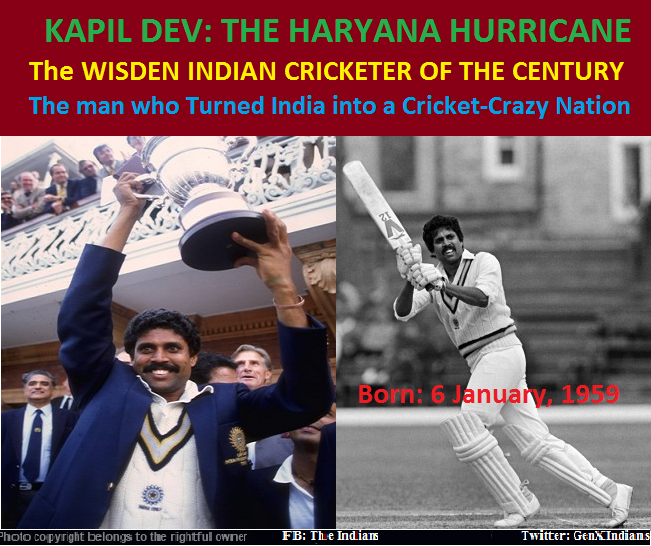 The Indians celebrate the 55th Birthday of the Haryana Hurricane. Despite India’s win in 2011 World Cup, can any Indian forget the sight of Kapil Dev and team lifting the World Cup at Lord’s!! That started a Cricket revolution in India. It is no less than exceptional talent that in a land where batsmen are considered God and bowlers are hardly noticed, he was awarded the Wisden Indian Cricketer of the Century Award in July 2002, ahead of Sunil Gavaskar and Sachin Tendulkar. The sight of an Indian lifting the World Cup for the first time!! The catch of Vivian Richards in the 1983 final that is considered one of the best in World Cup history!! World record 175 runs vs Zimbabwe!!! Destruction of England with bat and ball in bilateral series!! Hitting 4 consecutive sixes to avoid follow on vs England!! Hitting fastest Indian half-centuries!! Creating world records in test and ODI for bowling!! And many more… it will need a book to capture just the best moments of Kapil Dev that resulted in India’s rise in the World Cricket. He scored only one ODI century. But that 175 against Zimbabwe not only remained in the record books for a long time as the highest individual ODI score by a player, but also ensured that India first averted a knockout in 1983 World Cup. Later, he captained the Indian team to the historical world cup win in the finals against the invincible West Indies team. His international career started in 1978. In his debut series vs Pakistan he failed to impress by taking wickets in ODIs and Test matches, although his pace was certainly India’s best. But, by next series the world realized that he is there to make a mark. His trademark inswingers were considered lethal. His bouncers were on target and he was the only Indian pace bowler that other teams were wary of. He used to bat with the same pace as he used to bowl. 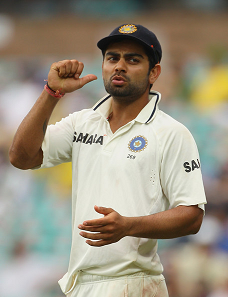 In his third test match, he scored the fastest Indian half-century taking only 33 balls. Later, he went on to score centuries too at a fast pace. His favorite opponents were England and Pakistan against whom he flourished. His effort of 10-wicket in test match against Pakistan is considered his personal best, while he won back-to-back Man of the Series against England in the series at Home and Away in 1981-82 season. The disastrous tour of 1982-83 to Pakistan saw his elevation to captaincy replacing Sunil Gavaskar. Before that he was made captain only when Gavaskar was rested. Under his captaincy, India defeated West Indies for the first time in an ODI during a tour to Caribbean. Then came the magical moment of 1983 World Cup where West Indies needed to complete the formality of going through the motions to win third consecutive time. India had won just one match in World Cup before 1983 when they defeated East Africa in 1975. Even Kapil’s performance of 32 ODIs, 34 wickets and 608 runs was not good enough to raise hopes on India reaching even the semifinals. But, miracles do happen. 1983 World Cup made the Cricket World believe in miracles as Kapil Dev lifted the World Cup. Kapil Dev led from front with a truly all-round performance with 303 runs (Average: 60.6), 12 wickets (Average: 20.41) and 7 catches in 8 matches. His catch in the final of Vivian Richards by running 20 yards is considered as the turning point of the final. After 1983 World Cup win, it took selectors just one year to hand over the captaincy to Sunil Gavaskar. Since then captaincy kept on switching between them. In 1987 World Cup, Kapil Dev captained India for the last time. The knee operation in 1984 reduced his efficiency as bowler. He grabbed 250 wickets by 1983. For remaining 205 wickets he had to wait for 10 years. In 1999, he was appointed India’s National Cricket Coach that lasted for only some time. During that phase betting controversy emerged but he came up clean. Born on 6th January 1959 at Chandigarh to Ram Lal Nikhanj, a building and timber contractor and Raj Kumari, a homemaker, Kapil studied at D.A.V. School and St. Edward’s School, Shimla. He married Romi Bhatia in 1980 and had a daughter, Amiya Dev. On 16th October 1978, he made his test debut at Faisalabad vs Pakistan. The journey continued till 19th march 1994 when he played his last test match vs New Zealand. In his 16 years of Test career, he was remembered as one of the Fabulous four player of his era with Ian Botham, Richard Hadlee and Imran Khan. He retired with 434 world record test wickets. To add to his test glory, he scored 5000 test runs too with 8 centuries and 27 half-centuries making him the only player ever to score 4000 test runs and take 400+ test wickets. During the earlier series of 1978 vs Pakistan, he started his ODI career that continued till 17th October 1994 when he played his 225th ODI, against West Indies. On 8 March 2010, Kapil Dev became the third Indian to be inducted into the ICC Cricket Hall of Fame, with Bishan Singh Bedi and Sunil Gavaskar. •	In early 1994, he became the highest Test wicket-taker in the world, breaking the record held by Sir Richard Hadlee. Kapil’s record was broken by Courtney Walsh in 1999. •	Kapil is the only player to have achieved the all-rounder’s double of 4,000 Test runs and 400 Test wickets. •	Kapil holds the record for the most innings in a complete career (184) without being run out. •	Won 4 Man of the Series Awards. Two against England at Home and Away, one vs West Indies in India in 1983-84 series, and other in Australia in 1985-86 series. •	Won 8 Man of the Match Awards in test matches. •	In 1988, Kapil overtook Joel Garner to become the highest wicket-taker in ODI cricket. His final career tally of 253 wickets remained a record until it was broken by Wasim Akram in 1994. •	According to the ICC cricket ratings for all-rounders in ODI cricket, Kapil’s peak rating of 631 is the highest rating ever achieved. He reached this mark on 22 March 1985 after a World Series final against Pakistan in Australia. •	Won two Man of the Series Awards, one during Texaco Trophy at England in 1982, and other during Benson & Hedges World Series Cup in 1985-86. •	Won 10 Man of the Match Awards in ODIs.